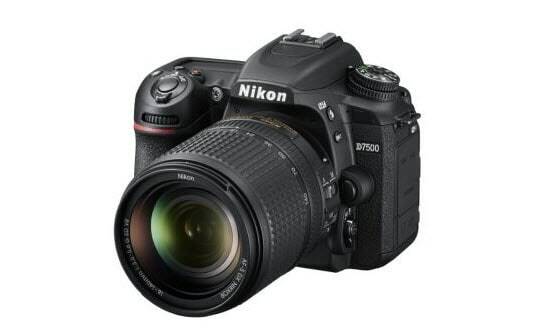 The Nikon's range of DSLR cameras has been broadened recently by the Nikon D7500. On April 27th, 2017 the legendary camera manufacturer introduced the successor to the highly esteemed Nikon D7200. Although the Nikon D7500 has the same sensor and processor as the Nikon D500, the latest Nikon's DSLR camera lacks some of the more professional features of the older model. The release of the Nikon D7500 is probably the biggest shake-up in the D7xxx series since the D90 model was replaced by D7000. Despite all the talk that the Nikon's latest addition to the D7xxx series offers fewer possibilities to the professional users, the Nikon D7500 is a DSLR that can create images of the highest standard. The appearance of Nikon D7500 doesn't step away from the traditional look of Nikon cameras and it is almost identical to the camera's predecessor D7200. Perhaps the biggest physical difference between the two cameras is the weight. With 640 grams D7500 is significantly lighter and much easier to carry around than the D7200. On the back side of the body, the Nikon D7500 has a 3.2 inch 922.000-dots tilting touchscreen LCD that has a 170-degree wide viewing angle. In addition, the camera is also equipped with an Eye-level Pentaprism Viewfinder that has a 100% frame coverage and 0.94 magnification. The camera is weatherproof, which enables you to continue shooting even when the weather conditions are not in your favor. The Nikon cameras have moved the boundaries for decades, and even though the Nikon's latest mid-sized DSLR camera may not be a game-changing camera it is still one of the best camera models in its price range. The camera's Nikon DX Format, 20.9MP APS-C CMOS sensor has a slightly lower resolution than the sensor used in the Nikon D7500's predecessor D7200. Omitting the low-pass filter enabled the camera manufacturers to compensate for the 4MP loss and to extend the D7500's ISO sensitivity range. The Nikon EXPEED 5 image processor is 30% faster than the EXPEED 4 used with Nikon D7200, which enhances the video capability, burst speed and ISO sensitivity that can be extended up to the staggering 1.640.000. The combination of the Nikon D7500's sensor and image processor guarantees that the camera will perform well in a variety of very different conditions and the demanding noise reduction algorithms enable the camera to perform well even in the low-light environments. The Nikon D7500 features a state of the art Multi-CAM 3500FX II Autofocus module with 9, 21 or 51 dynamic area points. The users can choose between eight different focus modes including Normal-area AF, Manual or the Auto AF Fine Tune. The Nikon's latest D7xxx series mid-range camera is equipped with an in-camera image stabilizer that additionally contributes to the clarity and sharpness of the images produced by the DSLR. Furthermore, the D7500 can be paired with every AF lens released since 1986, which gives the camera versatility when it comes to optics. The Nikon D7500 is a photo and a video powerhouse capable of producing strong image quality at high resolutions. The Nikon's latest D7xxx series addition can capture 4K UHD in 3,840 X 2, 160 resolution at 24, 25 and 30 frames per second, while Full HD videos can be recorded at 1,920 x 1,080 resolution and 60, 50, 30, 25 and 24 frame rate. The longest clip duration that the Nikon D7500 allows is 30 minutes and the camera also features a Time Lapse mode, which is perfect for shooting videos of the night sky or busy urban life. The camera can save the raw video footage on SD, SDHC and SDXC memory cards in MOV or MPEG4 file formats. The D7500 has only one card slot and some professional users who require large quantities of storage space might be forced to look for solutions to this limitation. Still frames can be taken in three different file formats JPEG+RAW, JPEG or RAW at the maximum resolution of 5, 568 X 3, 712 pixels. With an ISO sensitivity range of 100-51.000 that can be extended up to 1.640.000, this camera can serve a wide variety of purposes in outdoor or in studio conditions. The Nikon D7500 features Exposure modes such as Manual, Aperture Priority or Special Effects that enable the camera users to select the mode that best fits the requirements of the scene. In addition, the camera features Scene modes like Portrait, Dusk/Dawn or Close-up that automatically adjust the camera settings and enable the users to take a shot with ease. All footage can be transferred via HDMI or built-in WiFi to another device. In order to utilize the WiFi feature, the users must install The Nikon SnapBridge application on their iOS or Android devices. The Nikon D7500 is equipped with an external microphone and headphone jacks, that enable the professional sound recording with the camera, but sound recording is only possible while recording video. Even though all the signs suggest that the Nikon D7500 is a remarkable camera capable of producing amazing footage, too little time has passed since its initial release and it remains to be seen how well it performs over an extended period of time. The Nikon EXPEED 5 image processor enables the D7500 to shoot a burst of 50 RAW files at the rate of 8fps. The camera's EN-EL15a Rechargeable Li-ion Battery can hold for approximately 950 shots or nearly 80 minutes of recording HD footage. The Nikon D7500 is designed to meet all the demands a user might have since it can create breathtaking low-light landscapes, professional multimedia content or beautiful portraits. The Nikon's latest mid-range DSLR camera in the D7xxx-series is a capable all-around camera that improves on the imperfections of the previous D7200 model but fails to live up to the standards set by the iconic D500. The Nikon D7500 DSLR camera can equally effectively serve the needs of photography or videography enthusiasts and professionals that demand only the best performances from their cameras.